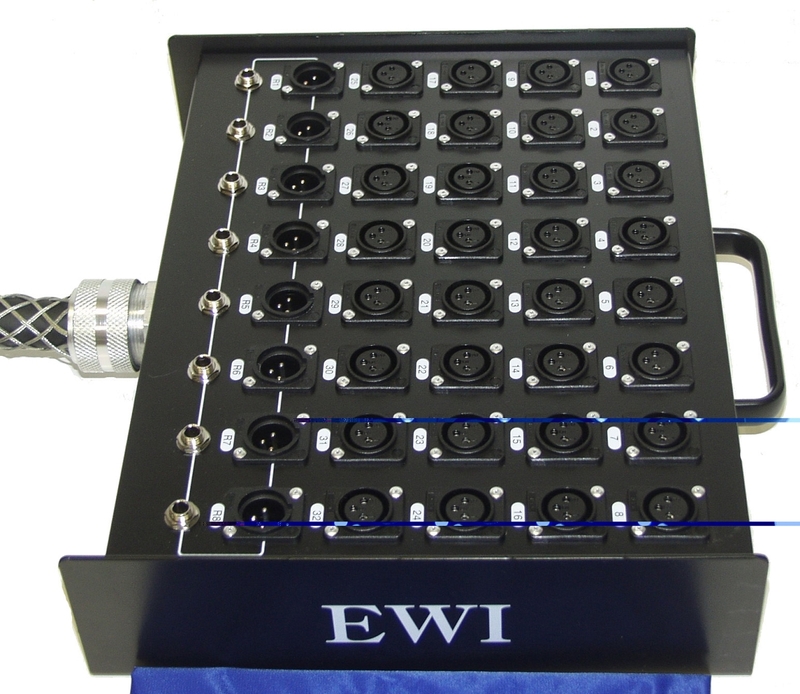 The EWI PSPX-32x8 series snake is a 32 channel XLR send snake with 8 XLR returns. The returns have a nice feature of parallel MXLR and 1/4" TRS panel jacks on the stagebox. The stagebox is very heavy duty and well labeled. The fantail is also heavy duty, color coded to groups and very well labeled. The main trunk is constructed with EWI SMC cable which is 40 individual shielded pairs, 22 ga., high copper purity conductors with double aluminum foil shield and trace wire, which is heavy duty, and very flexible. 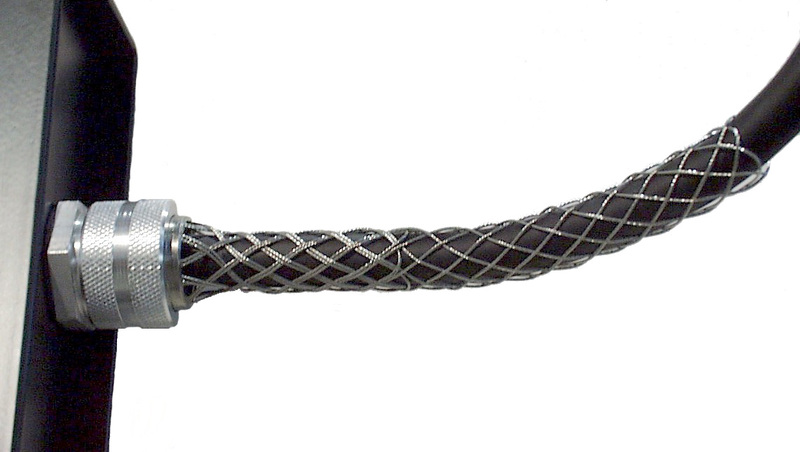 A mesh grip strain relief is provided at both ends of the snake. There is a mesh grip style hanger at the fantail end, and a mesh grip and rubber compression aluminum cable clamp at the stagebox. The panel jacks are the buttonless "spring loaded" style with composite (non metallic) bodies. The fantail is all XLR constructed with EWI ES3FB-GDP (FXLR) and ES3MB-GDP (MXLR) black shell with gold contact point connectors. Mesh grip style strain relief on the stagebox and fantail. Recommended primarily for install use, particularly the 150ft. version. If used for portable applications, this snake should be coiled in a "figure 8" fashion to avoid twisting. 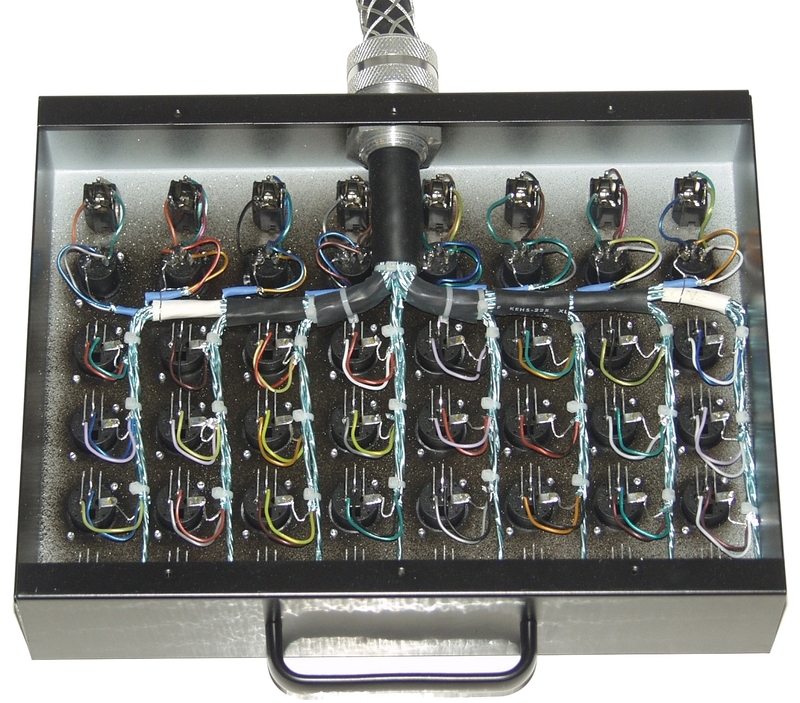 Returns: 8 channels balanced XLR with parallel 1/4" TRS and MXLR on the stagebox. Left to Right: 13 1/4""
PSPX-32x8-100: 100 ft, 71 lbs. PSPX-32x8-125: 125 ft, 80 lbs. PSPX-32x8-150: 150 ft, 91 lbs. PSPX-32x8-100-N: 100 ft, 71 lbs. PSPX-32x8-150-N: 150 ft, 91 lbs.